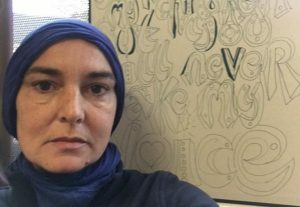 ”After having converted to Islam, Sinead O’Connor no longer wants to be around any white people whom she called “disgusting” and seemed to think include all non-Muslims. The 51-year-old singer, who now goes by the name Shuhada’ Davitt, even acknowledged that the sentiment she was about to express Tuesday is racist. This is the Washington Post, from the 7 November 2018. What can we glean from the above quote of our new sister to Islam? Instead of being an example for their people to embrace Islam, famous white converts stop them from doing that. Furthermore, they give the false impression that white Muslims, (whether they are ethnic whites from Europeans countries such as Bosnia, or converts to Islam), either do not exist, or no longer fall into the category of “white”. Of course, not all white converts have these beliefs. Yet, we see this often in the media – many of them behave in such a way that gives the impression that the white man is physical epitome of their enemy. Currently, white people are in acute spiritual crisis and in search for a higher meaning of life. Many white people have converted to Islam in recent years. However, white converts rarely marry from amongst each other, thus never starting white Muslim families and communities that would indicate to their people that they can find salvation and a peaceful familial existence in Islam. Instead, they tell them: to become a Muslim means to stop being white, to give up your whiteness, to hate it. Did the Prophet, peace be upon him, and his sahaba hold these beliefs? Did they say to the Arabs or Qurayshites that they should stop being Arabs and Quraysh if they want to become Muslims? Of course not, because in this case this Ummah would have died without even being born. It was not part of the prophecy to reject one’s people or culture. For example, the Abyssinian Muslims participated in their traditional ceremony in the Prophet’s mosque during Eid. This was not an Arab practice, but the Prophet (peace be upon him) allowed them to do it. All of the prophets came to their people with a call to them to believe in Allah and reject idols, but never their color, nor their language. In every story of the Qur’an in which they came to their peoples, their message was only to believe in Allah as the one true God, to do good works, and to believe in the prophets. Therefore, the responsibility of white Muslims is to convey to their tribes that self-hatred of one’s culture is not an Islamic belief. By White Muslims conveying this message clearly, we can serve as ambassadors to Islam instead of creating more animosity between our tribes and our fellow Muslims.